A live performance from Big Head Todd & The Monsters roused the STS-133 crew of shuttle Discovery from Mission Control, Houston on March 8, 2011. HOUSTON – Space shuttle Discovery and its six-astronaut crew began their last full day in space with a very special wakeup call today (March 8) – a live performance of a song that was inspired by NASA's space program and Discovery itself. 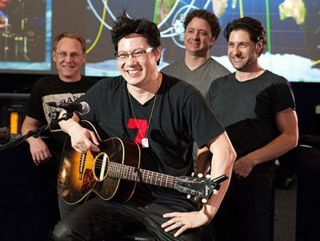 Lead singer and guitarist, Todd Park Mohr, performed the song in the middle of Mission Control, surrounded by his bandmates. Afterwards, Mohr was able to exchange some words with shuttle commander Steve Lindsey. "That was terrific – we really appreciate it, and congratulations on winning the contest," Lindsey radioed from space. Mohr thanked the astronauts for their courage and bravery, and wished them a safe and speedy return to Earth. Later, in an interview with NASA spokeswoman Brandi Dean in Mission Control, Mohr revealed that NASA's space shuttle program provided the inspiration for "Blue Sky" – specifically, Discovery's STS-114 return-to-flight mission following the shuttle Columbia tragedy. "It was for this vehicle," Mohr said. "The song was inspired by Eileen Collins, who was the female commander of the shuttle. I just found her story so inspirational. It kind of gave me a leaping-off point." The STS-114 mission launched July 26, 2005 and returned the nation's space shuttle fleet to space after the crippling Columbia disaster two years earlier. Fittingly, a song that was inspired by one of Discovery's most iconic missions now serenaded the orbiter's crew during the last leg of the shuttle's final mission. Mohr said his fascination with space and NASA's shuttle program has been longstanding. "I've always been fascinated, like everyone I know, with the space program," Mohr said. "It's just so inspiring – expanding the knowledge of humankind, of the cosmos and our place in it, the progress of science and exploration. I just find it amazing and I'm so thrilled to be here." The astronaut wakeup song was selected by the public in NASA's "Top 40 Song Contest," in which participants voted from a list of 40 songs that have previously awakened shuttle crews. Almost 2.5 million votes were cast in the contest, which ran from Aug. 20, 2010 through Nov. 1. "Blue Sky" topped the list, garnering 722,659 votes, or 29.3 percent of the total votes. During shuttle missions, astronauts are regularly treated to a daily wakeup song, which is typically picked for individuals on the crew by their families. For Discovery's final flight, however, NASA held a public contest to choose two wakeup songs for the astronauts on the final days of their mission. Yesterday morning, the contest's runner-up, the "Theme from Star Trek," was played for the crew with a new introduction recorded by actor William Shatner, the star of the original "Star Trek" TV series. Discovery is scheduled to land for the last time at NASA's Kennedy Space Center in Florida on Wednesday (March 9) at 11:57 a.m. EST (1657 GMT) after a 13-day mission to the International Space Station. The shuttle delivered a new storage room and a humanoid robot called Robonaut 2 to the space station. Two spacewalks were also performed to upgrade the orbiting laboratory. NASA is retiring its 30-year-old space shuttle fleet this year to make way for a new exploration program aimed at sending astronauts to asteroids. After Discovery's current mission, only two more shuttle flights are planned – one each on the shuttles Endeavour and Atlantis.